Front: Blank. Inside: Thanks for teaching me all the good stuff. Happy Father’s Day. Single Greeting Card with Envelope. Portal Publications Greeting Cards for Dad and Father’s Day. Front: Blank. Inside: A little off course, buy very loveable. Happy Father’s Day! Single Greeting Card with Envelope. Portal Publications Greeting Cards for Dad and Father’s Day. Golfers Christmas Ornament. Size: 4 inches. Christmas Ornaments Decorations and Golfers, Golfing, Golf Themed Holiday Decor by Kurt S. Adler. 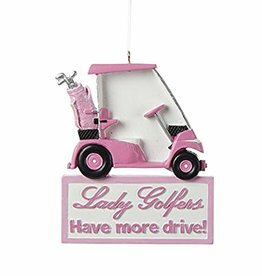 Lady-Womens-Woman Golfers Christmas Ornament. Size: 3.5 inches. Christmas Ornaments Decorations and Golfers, Golfing, Golf Themed Holiday Decor by Kurt S. Adler. Size: 2.5W x 3.5D x .25H inches. Golf Club Bottle Opener in Plaid Gift Pouch. Brass and Sheesham Wood. Great Golfers Gifts, Fathers Day Gifts, Dads Gift! Two's Company Fine Decorative Home Accents and Gifts. Size: 6 inches. Golfers Golf Bag Glass Ornament. Christmas Ornaments and Decor by Kurt S. Adler featuring Blown Glass Ornaments Golf Golfers and Golfing Themed Ornaments collection. Size: 4.5 inches. Sports Golf Themed Christmas Ornament by Kurt S. Adler. Size: 3.5 inches. 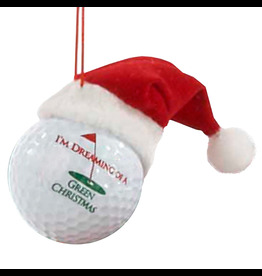 Sports Golf Themed Christmas Ornament by Kurt S. Adler. Inside Reads: - Relax, unwind and enjoy Happy Mother's Day - Single Greeting Card with Envelope. Caspari Stationery and Greeting Cards. Paper Products for Entertaining. 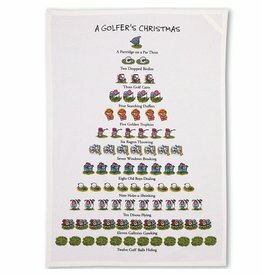 A Golfer's Christmas Holiday Flour Sack Kitchen Towel. Size: 18 x 26 inches. 100% Cotton. Peking Handicraft Inc. Handcrafted quality handcrafted linens for the home. David Price 12 Days of Christmas Towels.